A fugitive Turkish Alevi with Syrian citizenship and a checkered past has emerged as the chief instigator and overseer of last week’s massacres in Bayda and Banias. A native of Hatay Province in southern Turkey, his real name is Mihraç Ural. 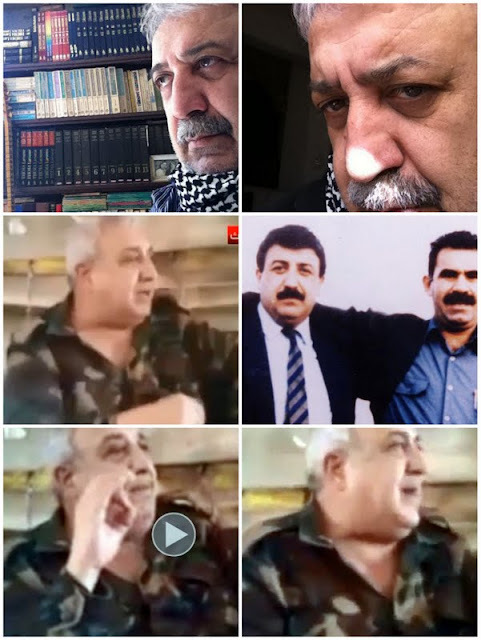 In Syria, where he commands the “National Resistance” militia, a shabiha subdivision, Mihraç Ural goes by his Arabic nom de guerre: Ali at-Kayyali. On the day that Mihraç Ural aka Ali at-Kayyali made the headlines for saying in a leaked video, “We need to cleanse Banias of traitors at the earliest,” a Syrian Sunni Muslim survivor gave on air his grisly nine-minute eyewitness account of last week’s massacre in the coastal city. Details of the human carnage in western Syria over the weekend, in which pro-regime militias slaughtered hundreds of Sunni residents, most of them women and children, point to a deliberate act of sectarian cleansing in the Alawites' heartland. The London-based Syrian Observatory for Human Rights said possibly as many as 100 Sunnis were killed Thursday in Bayda, a village outside the city of Banias. It cited witnesses who said some of the dead were killed with knives or blunt objects and that dozens of villagers were still missing. Pro-regime militiamen stormed the Sunni neighborhood of Ras el-Nabeh the following day, Friday (May 3), killing hundreds more. Ural aka Kayyali is believed to have commanded the militiamen. “Banias? The only exit route for those traitors is the (Mediterranean) sea. We are Banias! “In any case, Jableh (a nearby coastal city) is under nationalist forces control. It cannot possibly be a base or pathway for our foes. “Sooner or later, we’re supposed to lay siege to Banias. I mean what I say: cordon off Banias and start the ethnic cleansing. Ural left Turkey for Syria after the 12 September 1980 Turkish coup d'état, headed by Gen. Kenan Evren. He is said to have introduced PKK leader Abdullah Ocalan to Hafez Assad, Bashar’s father, in Damascus. A photograph showing him with Ocalan is still posted on Ural’s Facebook page. Ural has previously recorded videos in staunch support of the Syrian regime, including one uploaded in January in which he threatens “traitors” against “descending on Latakia and the coast,” in reference to rebels fighting against regime troops in the chiefly Alawite areas of western Syria. Having led the Turkish Peoples Liberation Party/Front (THKP/C) and its deadly splinter faction called the Hasty Ones (Acilciler), a leftist group established in the 1970s, Ural is also remembered in Turkey as the instigator of an anti-government march in Hatay last September. Hatay has a population of 500,000 Alevis. Alarabiya anchorwoman Nadine Khammash interviewed on air the Syrian Sunni Muslim survivor who gave a grisly nine-minute eyewitness account of the massacre in Banias. To protect his identity, Ms Khammash introduced him in yesterday’s Evening News as “Abu Muhammad.” And he answered her questions from a darkened room in Lebanon. (In the days leading up to the massacre) there was nothing untowardly going on (in Banias). People were moving around easily and without worry. Yes, there were checkpoints but no one was being stopped. Checkpoints did not proliferate until Wednesday (May 1), when people were ordered to cease their goings and comings. Everything stopped coming in… no bread anymore, no this and no that. People started getting anxious. They felt uneasy. On Thursday, they headed to the bridge, close to the checkpoint. They were about 500-600 men and women. The soldiers manning the checkpoints ordered them home, telling them they were animals. Dusk was falling rapidly and people headed home perturbed. Some wanted to sleep outdoors. Streets remained almost deserted on Friday morning. A salvo of gunfire in the air met anyone who dared get anywhere near a checkpoint. Shelling of Banias started at about 3-3:30 p.m. – mortars and tank shells from al-Awz Bridge, al-Qosoor neighborhood and Ras al-Nabeh bridge. We then saw them (militiamen) move in from al-Awz under gunfire cover provided by the army. They were about 150 men. They forced their way into the first house, herded everyone out, lined them up against the wall and shot them dead. They knifed to death four or five people in the next house. My immediate family having left Syria, I started running to save my skin. I found a tiny aperture, where I stood motionless for one-and-a-half hours. They were forcing people out of their homes, lining them up against a wall and shooting them. They shot or knifed to death 35 of my relatives, one of them a two-week-old baby and eight children less than three years of age. I am Syrian. Sometimes I could not figure what they were saying. Some were wearing battle fatigues, others not. The footwear of some was white. After they left, I saw they had torched the limbs of two dead children. They killed 16 members of the Rajab family. Of the Jalloul family, they killed Abul-Abd, his two sons, his six daughters, his father – who was wheelchair-bound – his mother and his two brothers. All members of the Dandash household were burned in their home.